For the first time, the majority of shows in the commercial West End charge more than £100 for their best seats, The Stage’s annual ticketing survey can reveal. 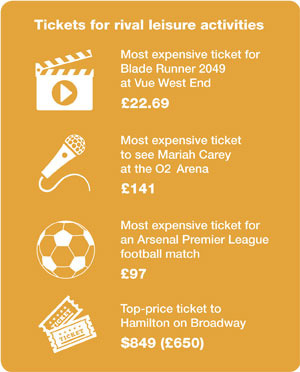 The research found that 20 out of 37 commercial shows have top-price tickets costing £100 or more. In 2012, when the survey began, not a single seat cost this much. 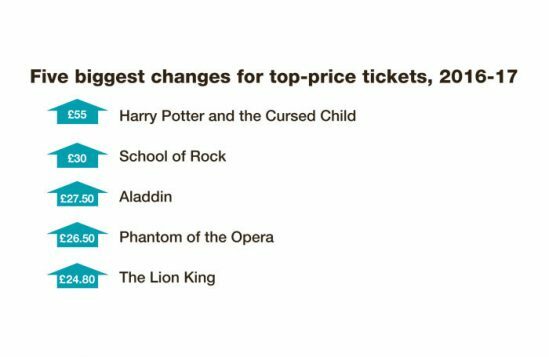 Shows that have exceeded £100 in the past year include The Phantom of the Opera and Harry Potter and the Cursed Child. The most expensive ticket for both shows is now £125. 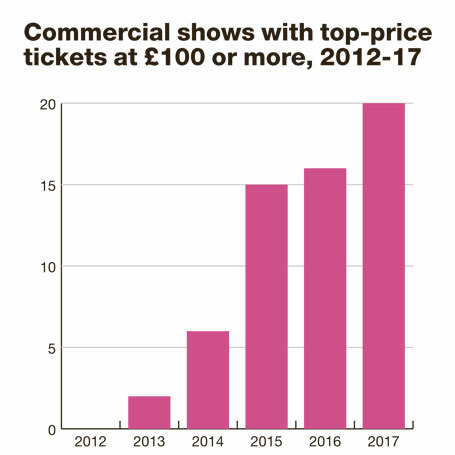 For commercial theatre, the most expensive ticket averages £112.76, almost double that of its equivalent in the subsidised and not-for-profit sector, which is £59.80. 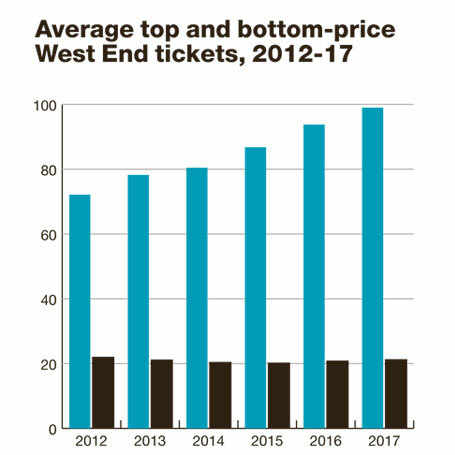 The average top-price ticket across the West End is £98.99, a figure The Stage expects to surpass £100 for the first time next year. 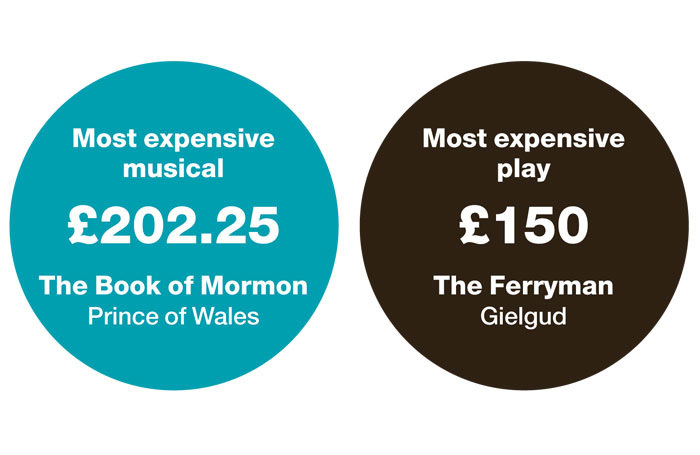 Both the most expensive play and musical in this year’s survey, The Ferryman (£150) and The Book of Mormon (£202.25), are produced by Sonia Friedman Productions. A spokesman said: “Sonia Friedman Productions continues to be firmly committed to ensuring that, along with higher-priced tickets, there is always a meaningful number of accessibly priced tickets available in advance and on the day for all its productions. To ignore that is to not acknowledge the full picture. 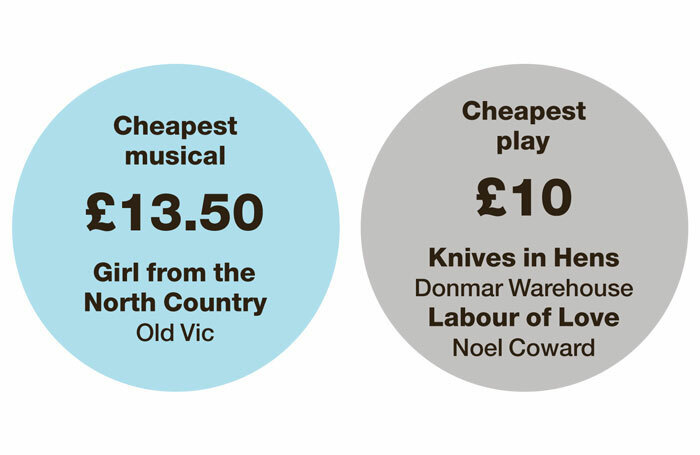 The cheapest ticket at a West End show now costs an average of £21.38, with 27 productions offering seats at £20 or less. Mark Guymer, managing director for ticketing at Really Useful Theatre Group, said: “It’s important to note that it is still a very small percentage of tickets that sell at the top prices. As The Stage’s ticketing survey moves into its sixth year, top-price tickets in London’s West End continue to rise. 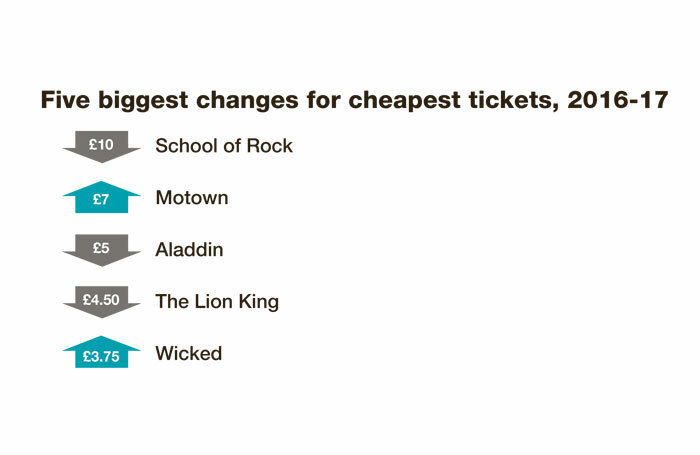 This year, more shows than ever are charging more than £100 for their best seats. 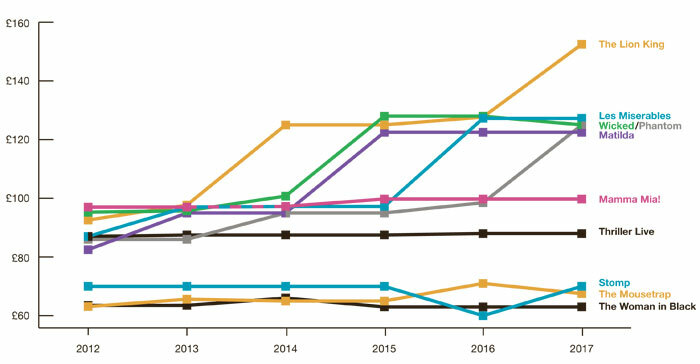 The survey is an annual snapshot of West End ticket prices, covering the commercial sector as well as subsidised and not-for-profit theatres. For the fifth year running, musical The Book of Mormon is selling the most expensive seat across the entire West End, which remains at £202.25 for the third year in a row. However, others are catching up, with Hamilton – which is set to open in December – charging £200 for its most expensive ticket. 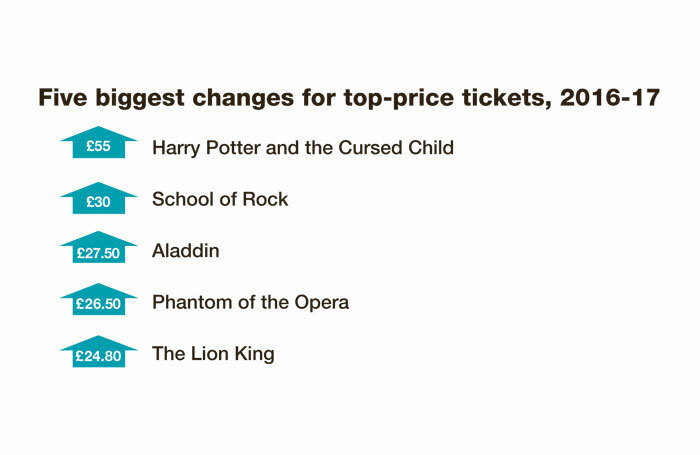 The best seats for plays are also increasing rapidly, with the most expensive costing an average of £78.95, an increase of £10 compared with last year. 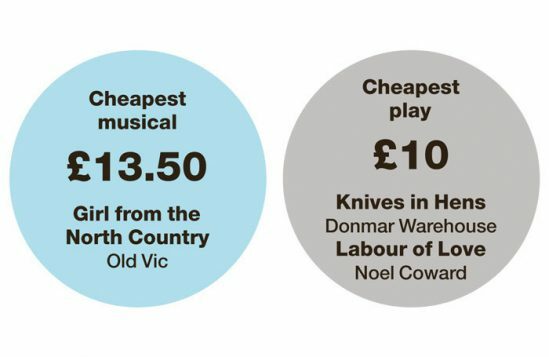 While top-end prices continue to creep up year-on-year in the West End, it is important to note the comparable cost of theatre tickets on Broadway, where the most expensive ticket for Hamilton costs $849 (£650). 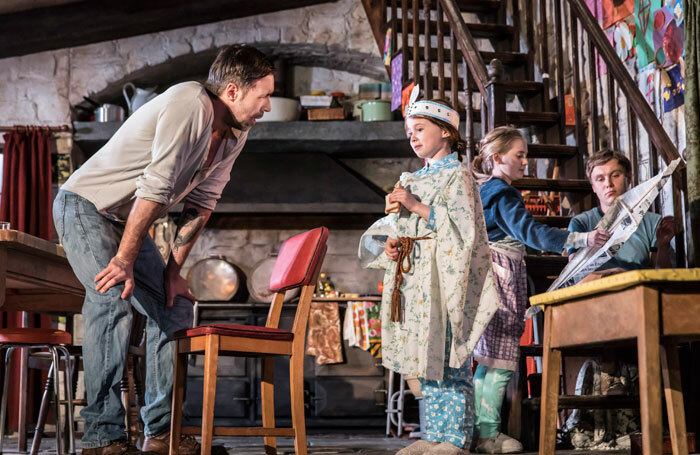 At the other end of the scale, many London shows offer accessible ticketing schemes, such as Ink at the Duke of York’s Theatre, where 20,000 tickets have been made available at £20 or less, or The Ferryman, which sells more than 37,000 seats at less than £25. Others include School of Rock, which offers a rolling lottery for £15 tickets, and ongoing schemes at subsidised theatres such as the National Theatre and the Donmar Warehouse. National Theatre executive director Lisa Burger said theatres must offer a range of prices “in order to balance the books”, but that the NT was working to ensure pricing is not a barrier for people attending the theatre. 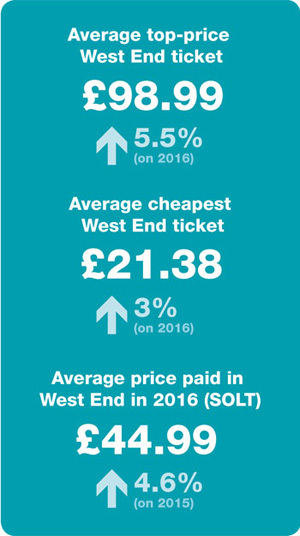 Earlier this year, the Society of London Theatre’s annual box office figures found the average price paid for a West End ticket in 2016 was £44.99; outside London, the average price paid for a member venue of UK Theatre in 2016 was £24.71. The average cheapest seat in this year’s survey was £21.38, rising above £21 for the first time since 2013. 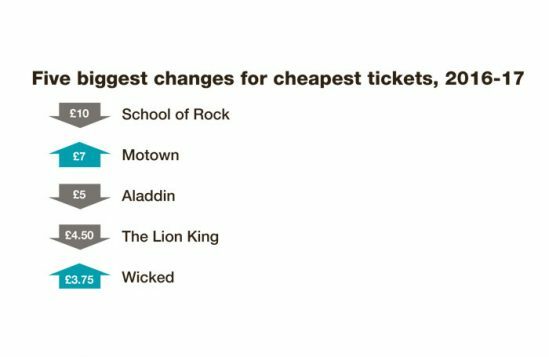 Despite this, the cheapest tickets have remained broadly similar throughout the six years of The Stage’s survey. 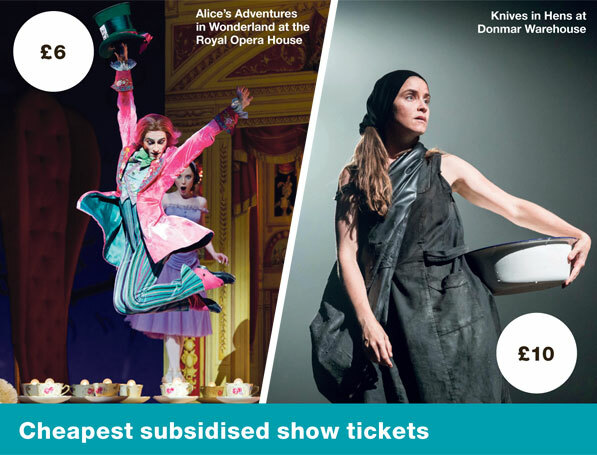 In the subsidised and not-for-profit sectors, the average top-price ticket has dropped from £68.67 to £59.80, but last year’s figure was inflated by high prices for shows at the Royal Opera House and the Old Vic, both of which have fallen in 2017. We have adopted a consistent methodology for buying tickets every year to compare prices as closely as possible on a like-for-like basis. To define a West End show, we considered all theatres with full membership of the Society of London Theatre. Prices were taken from the online purchase price for each show. We first contacted representatives for each show, asking them for the top and bottom ticket prices. We then checked this information by going to each show’s website and following links to its official vendor. If more than one vendor was listed, we took the first option (unless another was billed as having no fees). All ticket prices include booking or administration fees. Prices quoted are for evening performances on September 30, 2017. If a venue was in preview or was sold out, we moved on to the next available non-preview Saturday evening show. Prices quoted are for a single ticket. Seats that were not available to book online were not included. Standing tickets were also excluded for consistency. This extended to Shakespeare’s Globe, where standing tickets were available for all performances priced at £5. When different delivery options were available, we always chose to collect at the box office. When recording top-price seats, we opted for the most expensive ticket without added extras, such as VIP lounge access, drinks or snacks. When recording bottom price, we opted for the cheapest full-price ticket, excluding discounted seats.